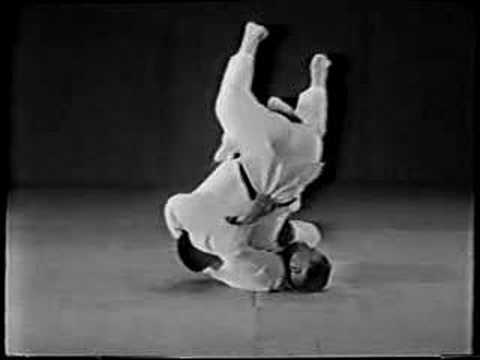 The accent was on youth with its concomitants of speed, power, endurance and dazzling Judo technique as the 1960 All-Japan Judo Championships came to a close. Twenty-three year old Akio Kaminaga, 5 Dan (225 lb. 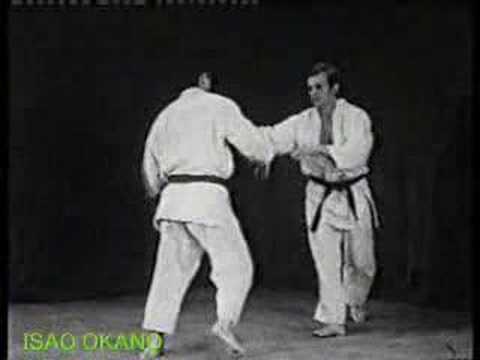 runnerup to 6 Dan 'World Champ K. Sone in 1958), using skillful strategy, powerful Judo style, and taking advantage of pairing circumstances which were decidedly in his favor, wrested the crown from defending titles, Isao Inokuma, 5 Dan, in a bitterly contested 20 minute battle. The victory, awarded by a close decision, avenged the loss Kaminga suffered to Inokuma in last years final. 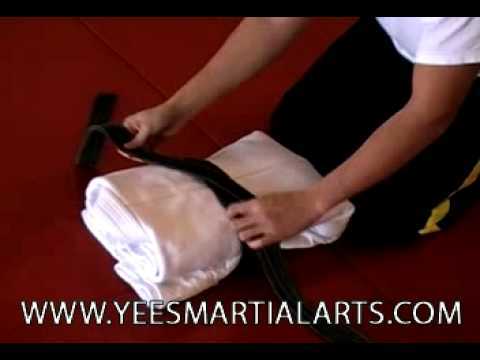 This tournament, as in past years, further supports the thesis of the writer that Judo championship caliber requires of the participants to couple efficient Judo technique with a young, physically powerful body. Veteran judoka over 26 years of age found the going extremely difficult and the blistering pace set by the younger men overwhelming any advantage of experience possessed. The 1960 Shiai was conducted on a different basis than has been standard in past years in that competition was scheduled over a period of two days, the first day of which was the contesting of 48 competitors arranged in groups of "threes" competing on a Soatari (round-robin) basis, with the winner advancing to the normal pattern of Tentori (single elimination) shiai on the second day. Such competition places a premium on endurance and it was evident from the outset that youth with power and stamina would be the survivor. Pre-contest favorites included aging World Champion K. Sone, 6 Dan; 1959 All-Japan Champ, I. Inokuma, 5 Dan; powerful challenger, A. Kaminaga, 5 Dan; speedy, skillful stylist, K. Watanabe, 5 Dan; Osaka policeman, M. Kawano, 5 Dan; Kyoto's giant (6'3"--200 lb.) 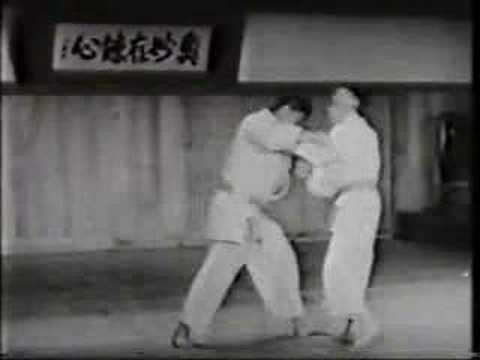 Y. Oda, 5 Dan; and 1959 University Student Champ, M. Shigematsu, 4 Dan. The first day of competition (Soatari) progressed more or less as anticipated and was characterized by clean-crisp techniques. The Champion, Inokuma, advanced powerfully with lightning-fast Judo and his victims joining his "Taio-toshi and Seoinage Club." In a major upset, World Champ Sone fell miserably before the onslaught of former Tenri University star, Wakita, 4 Dan, who got an early start on Sone by scoring Wazari by Osotogari which startled not only Sone, Wakita and the audience, but the Referee as well, who paused not being able to believe what he had witnessed and waited many seconds before calling a partial point. Wakita applied continued pressure and put Sone in constant difficulty by shedding off ineffective attempts of the best Sone could muster (Osotogari and Uchimata), and keeping Sone in completely defensive Judo for most of the bout until a devastating Osotogari pounded Sone to the mat for the score. Sone in his second match eliminated himself by barely obtaining a Yuseigachi over a relatively feeble opponent. 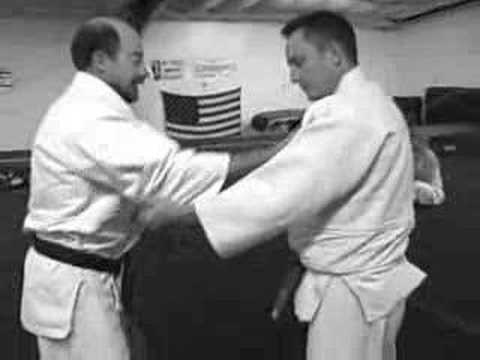 It is a splendid example of the inability of "oldsters" to keep pace with modern youthful Judo in Japan. Sone, hampered by age, injury and lack of condition due to domestic requirements, presented a pityful sight to those who remember him as the great champion he was. Sone's elimination put Meiji University's captain, M. Shigematsu into the running, who advanced easily in his eliminations. Kaminaga got off to a slow start, having trouble with his first opponent, a Sandan, and had to be satisfied with a Wazari by Taiotoshi and later completing the score with a very secure Osaekomi. Speculation about Kaminaga's condition due to his recent junket to Europe as a "Judo Ambassador" was prominent, but his next aged opponent (32) went down quickly to a Taiotoshi thus advancing Kaminaga. Kansai area Judoka Kawano and Oda advanced rather easily. 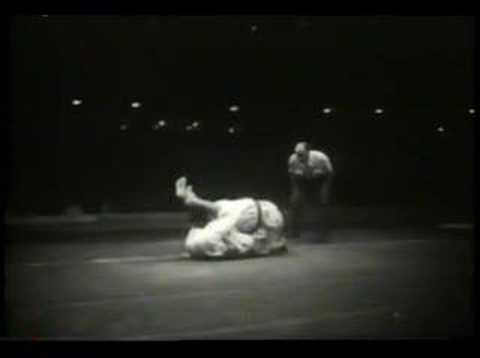 One of the most skillful stylists and perhaps the possessor of the most deceptive Judo in Japan, K. Watanabe, "out-danced" his opponents but was eliminated by Hansokumake (violation of rules) when the Referee charged him with deliberate dumping of his opponent outside the contest area. In one of the most interesting bouts of the entire tournament, tiny (149 lb.) H. Iwata, 4 Dan, competed against gigantic (317 lb.) R. Miyake, 5 Dan. These two are the quantitive "Mr. Small" and "Mr. Big" of Japanese Judo. 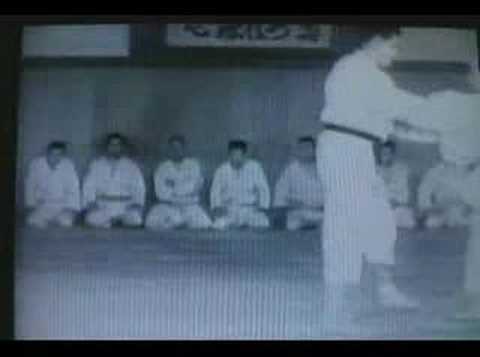 Iwata is reminiscent of the famous Osawa, 6 Dan, and attacks with similar skillful, brainy, tiger-like ferocity, using a sureness of body control which is beautiful to behold (Iwata held Kaminaga to a Wazari decision in 1959 All-Japan and defeated Inokuma in 1959 East-West). Iwata carried the fight to the mammoth Miyake (as yet un-thrown in major competition) and was never behind, setting Miyake rudely down on his large posterior with a wicked Kouchigari followed by grappling from a rear choking position astride Miyake's back. Miyake, in panic, rolled lumbersomely off the mat, coming up on all fours with tiny Iwata perched astride him much to the amusement of the audience. Shortly thereafter, Iwata succeeded in doing what no one else has ever done......throwing Miyake over the top with a slow, but positive Tsuri-seoinage, but the elephantine landed outside the contest area for no score! (Iwata is often used as case in point for argument against weight classes, but stands as an exception......being extremely powerful for his size and is not an accurate index. Then too, Miyake in this match was miserably out of shape and did nothing but stand). The emphasis on youth, power and endurance continued emersed in sparkling waza as confused "oldsters" fell beneath the pounding pace of round-robin Judo. Advancing impressively were two teammates from Nihon University, T. Koga, 4 Dan (who at 20 years has met contest requirements for 5 Dan but must wait two more years for that rank due to age restrictions! ), with a flowery high-speed style of Uchimata and Ouchigari, and Tokyo's "wonder boy" S. Ito, 4 Dan, who literally blasted his opponents off the mat. The most captivating bouts from the standpoint of audience sympathy was the performance of young (19 years) K. Seki, 3 Dan, who as a high school boy was making his first appearance in major action. Seki, with furious abandon and tenacity, overwhelmed his bewildered senior opponent, whom I am sure must have thought there were two opponents after him! Continuing this pace against his second opponent, the wily Matsumoto, 4 Dan from Tenri University, Seki almost managed his advancement to the second day finals but was caught on a Wazari from a Kaeshi executed Yokootoshi as Seki took too leading a stance. On the second day, 16 finalists met, competing on a single elimination basis. In one major bracket, Kawano, Kaminaga, Iwata, Shigematsu ........ in the other, Koga, Inokuma, Ito and Oda. It was this turn of circumstances in pairing which gave Kaminaga a relatively easy entrance to the finals, conserving his energy, while his opponent to be, Inokuma, had to battle long and hard for the same entrance. Kawano gained a clearcut decision over his first opponent. Kaminaga, a Meiji U. alumnus, faced a Meiji opponent who took an obvious "dive" for him early in the bout at no expense to Kaminaga's energy reserve. Iwata battled the stable Shigematsu on more or less equal terms, but Shigematsu's relentless attacks gained him a close decision. In the other bracket, Koga scored easily to advance. Inokuma, meeting powerful and reckless Ito, was held to a decision at the expiration of time, but was clearly superior as Ito did little but defend. Oda drove in hard for his usual long-legged, hopping type of Uchimata for an easy score. In the second round, Kaminaga faced his only true prefinal bout of the day against Kawano. After a slow start, Kaminaga managed a driving Ouchigari Wazari and a bit later filled the score with a smashing Taiotoshi. Shigematsu advanced easily. The second round in the other bracket saw a terrific battle between Koga and Inokuma. Koga, a willowy speed-merchant, has a spinning, whip-like left Uchimata (much like J. Osako, but faster and more powerful) which is easily changed by him into a ripping Ouchigari. Inokuma stalked Koga, taking the initiative as he always does in shiai, but unable to do much. Koga knifed in for the kill time and time again, stumbling Inokuma several times with Ouchigari and once forcing Inokuma to twist and dive for the mat to save the point. Koga was confined to the mat edge by Inokuma's forward tactics, but managed to spin in to fling Inokuma to the ground with Uchimata just outside the mat area (Inokuma told me afterwards that it was this Waza which shook his confidence.). Things looked dark for Inokuma, but with a desperate blur of speed Koga was whirled overhead by Seoinage for a Wazari which gained a decision for Inokuma at the expiration of time. 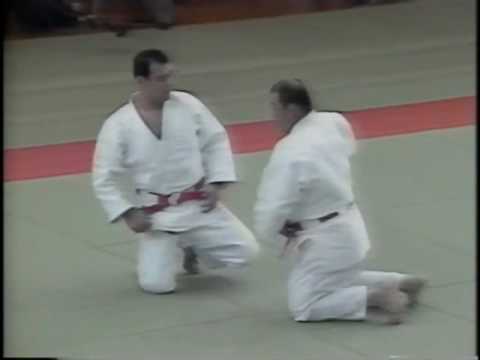 Oda spilled his opponent easily with Ura Kaeshi twice for Awase Waza. In the semi-finals, Kaminaga faced his second Meiji opponent in Shigematsu who danced rapidly around in the opening seconds of the bout and took an unmistakable "dive" for a Nage-no-Kata like Ukiwaza. This additionally greatly economized Kaminaga's energy and force Inokuma into almost immediate action against the Kyoto goliath, Oda, who was making his bid for the title for the 5th time. Oda was determined not to let Inokuma, who had humiliated him in the 1959 matches, push him around, and carried the fight to Inokuma. Inokuma, unable to enter for his pet Seoinage, fought back with "roughhouse" tactics which smashed and clobbered Oda around, both on and off the mat. Oda worked desperately to obtain his driving Osotogari only to be smashed to the mat time and time again in failure. 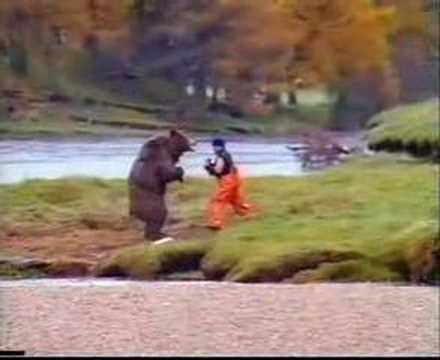 Stances were unorthodox, with standing in a deep right posture gripping Inokuma's right lapel with both hands while Inokuma standing similarly with his left arm dangling loose hoping to seize the giant's right leg as it attacked (Inokuma is extremely powerful from weight training and can easily clean 250 lbs.) At the expiration of time, the officials could make no decision and ordered OVERTIME. Inokuma infuriated with this decision, used the roughest tactics seen in a long time. 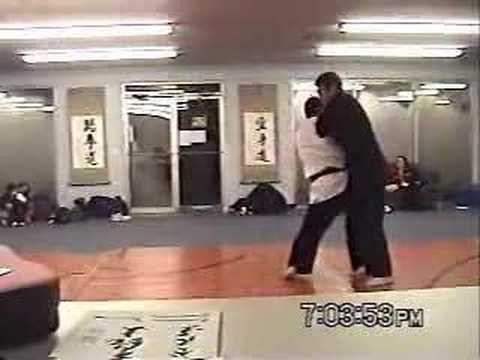 Making use of Morote Gari time after time to tackle or scoop Oda up, one time smashing into Oda from mid-mat and driving Oda out of bounds, across the safety perimeter, and off the platform to the concrete 3 feet below! Oda never recovered from this treatment and complained of a back injury. As time wore on, it was evident the 31 year old Oda was running out of gas. 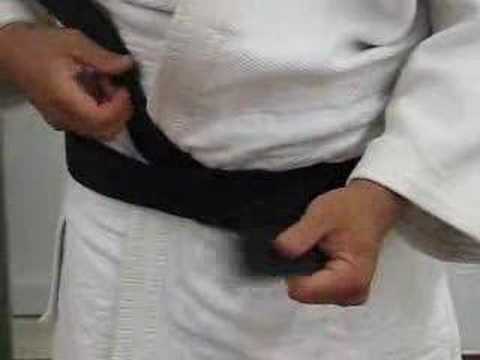 Inokuma too showed the strain as his famous power pull for Seoinage ceased and he contented himself with knocking Oda down and clamped on his vice-like Yokoshihogatame (from which there is no escape) for the score before the expiration of the overtime (15 minutes). Both opponents were obviously tired and beyond rapid recuperation. (Ito, Koga, and Oda confided in me that after their bout with Inokuma, they were exhausted. Inokuma told me at this point that he saw no hope for victory over Kaminaga by throwing technique). In the final, fresh Kaminaga, who had fought less than 8 minutes all day and had enjoyed about 50 minutes rest (compared to 35 minutes of fighting and 12 minutes of rest for Inokuma), was visibly confident of victory, knowing Inokuma's fatigue. It was here that Inokuma, even in defeat, demonstrated the truly great qualities of a champion by carrying on a 20 minute battle against the sturdy Kaminaga, greatly reducing any special acclaim Kaminaga should normally receive by winning the title. The bout began cautiously with Kaminaga taking no chances against the Seoinage which had done him in on their last meeting. Kaminaga clamped a defensive grip on Inokuma for the first few minutes, blocking the Seoinage attempts and adding to Inokuma's fatigue. Then, with clever tactics, Kaminaga invited grappling, not with the idea of obtaining a score (Kaminaga is inferior on the ground), but to hasten the energy collapse of Inokuma. Kaminaga remained carefully near the mat edge should the going get tough, and kept Inokuma in an attacking position. Inokuma tried desperately to haul Kaminaga to the center but the position was nullified by the Referee and combat resumed from standing. Inokuma attacked with Seoinage ..... but the sting was gone ..... fatigue was the real enemy of Inokuma. Kaminaga, satisfied that Inokuma was helpless, opened up and managed a Kosotogari which Inokuma rolled out of, but spilled onto his knees in doing so. This proved the slight margin necessary for Kaminaga's victory. Inokuma knocked Kaminaga down and was driving into grappling attack as the bell sounded. 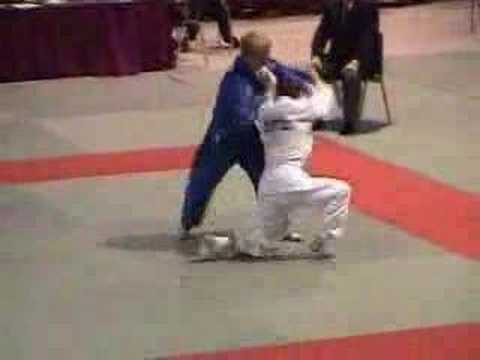 The new champion is a deserving athlete, a possessor of dynamic Judo style and powerful, smashing attacks. He represents the youthful element which rules modern Judo (story on his training methods which include weight training in future issues). His victory came after a long grooming and hard work which will bring new credit to him and unavoidable, additional respect for his defeated rival, Inokuma.